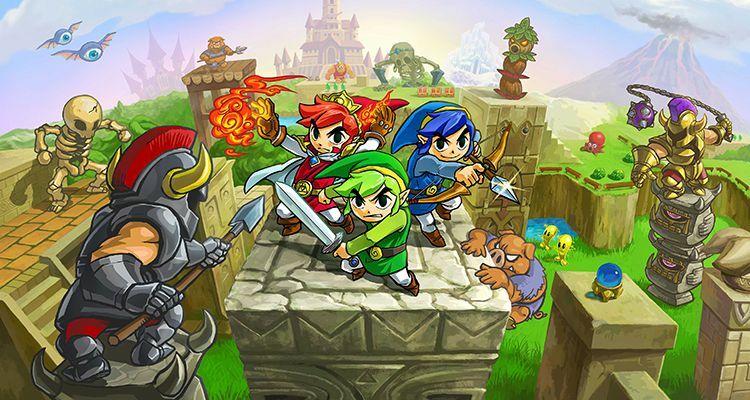 After seventeen titles, does The Legend of Zelda: Tri Force Heroes keep the same appeal that has allowed the franchise to be successful, or is the storied franchise running out of new ideas? Four Swords has shown us that having more than one Link can bring new elements to the table if done correctly. 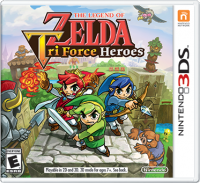 Is Tri Force Heroes the adventure the fans have been craving for, or just a gimmick that should be forgotten? The Legend of Zelda: Tri Force Heroes is the eighteenth official game in The Legend of Zelda series. It takes place several years after A Link Between Worlds and the players takes control of the same Link from that adventure. 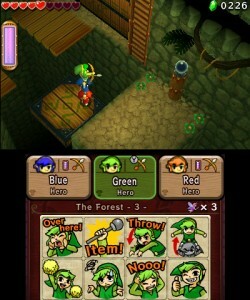 Those that enjoyed A Link Between Worlds will be happy to know that Tri Force Heroes features a similar look with vibrant colors and a top-down overhead view. The action-adventure game that we’ve all come to love over the past 29 years stays true to the formula. An evil witch places a curse on Princess Styla, denying her beauty and style by forcing an irremovable, ugly jumpsuit on her. The kingdom of Hytopia is sent in to a frenzy as the villagers become frightened that being too stylish may cause the witch to curse them too. King Tuft believes in the legend of the Tri Force Heroes and the player just so happens to meet the description. The story is ridiculous that it seems like a joke and lacks the richness found throughout previous worlds. When first starting it out it was fun to joke along only to find out the lame joke runs throughout the whole game. Either way, the game is more about its gameplay than its story. Nintendo somehow continues to innovate and make Zelda games enjoyable and challenging. Legend has it that the Tri Force Heroes can form a totem that can overcome all challenges. This allows for a change in puzzles as certain aspects will only be reachable by forming a totem of two or three Links. This new feature is also accompanied by some familiar items such as the bomb, boomerang, and bow. Of course, no Zelda game would be complete without new items, as the fire gloves and ice rod make their debut. The player has three modes in which to take part in including multiplayer, single player, and coliseum. Multiplayer allows the player to journey the Drablands in two ways, locally or online. Locally does require two friends but does have download play, meaning only one person needs a copy of the actual game, and the two others can join in on the fun. Online play can also connect friends, which must be added prior to the game through Nintendo’s outdated Friend Code system. While this system works most of the time, it isn’t perfect. To be successful, a competent team is required and the lack of a rating system that pairs users with people of similar skill makes cooperation difficult. Rather than using puzzles that require players to work simultaneously on different aspects, which allowed Four Swords to be successful, the players are stuck with the totem mechanic where players stack on top of each other. This is a staple throughout all the worlds, making it very difficult to progress if you’re not playing with friends or competent strangers. Online play seems to be hit or miss, playing with people that work together and others that make it impossible to beat the level. The game relies too heavily on this mechanic and lacks the variety to really make the game challenging. Single player is done in a similar fashion, except you’re in control of all the Links as there is no co-op AI, just “dopples,” or stone figures that become a statue when switching between Links. This style of gameplay becomes very irritating as the task of running around with two stone figures can be cumbersome. That said, the game is definitely meant to be enjoyed with two other friends. Coliseum pits the player against the other two links in a free-for-all. The levels have a multitude of items to choose from to try and bring your opponents’ hearts down to zero. This seems to be the best place to use the different outfits that are made at the local seamstress Madame Couture. This is a new aspect that doesn’t seem to have too much of an impact throughout the story mode. The outfits enhance abilities, such as shooting three arrows instead of one. Coliseum mode seems to have been thrown without thorough development or thought. It lacks any real strategy and players will be subject to the spamming of the item button. The captivating story mode and innovative gameplay has been The Legend of Zelda‘s draw for the life of the franchise. 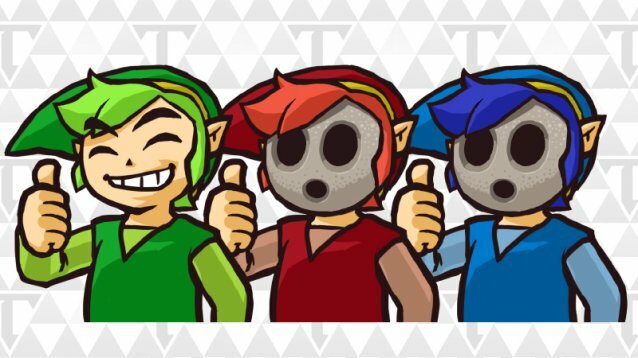 Tri Force Heroes is no exception. The totem system is what makes and breaks the game. If you’re not playing with friends, the online experience is random. A simple rating system that pairs players with like ratings could have fixed this issue but none is to be found. Single player seems like an afterthought and just feels more like a chore carrying around stone statues than an adventure. Replay value is always nice and the game offers challenges in each of the levels in the Drablands. One strange thing Nintendo failed to add was Amiibo support. Being forced to carry stone statues in the single player could have easily been fixed with Amiibo. Packaging all three Links in their different colors and allowing the player to level each one up through the coliseum would have been enticing. Then when playing through single player, touch the Amiibo to the 3DS to activate an AI representative of the work you’ve done in Coliseum. The stylish nature of the game could have also benefited from supporting already released Amiibo as costumes. The lack of support just makes it seem like not a lot of thought was put into the game. Either that or this game was long in development before Amiibo were even thought of. While it benefits from being one of Nintendo’s greatest franchises, it is still The Legend of Zelda we’ve come to love. The gameplay is familiar but new in a way that it’s easy to pick up. The new items are some of the coolest things to ever come from a Zelda game. Often with Nintendo franchises, they find a formula and do it very well, but everything outside of the formula often feels lackluster. Is it something that should be overlooked just because of the franchise’s history? Mind-testing puzzles, innovative gameplay, and a captivating story are the main reasons why why we people play Zelda games, and Tri Force Heroes meets all the criteria. Even with the criteria met, the game feels poorly thrown together. Matchmaking is random and takes away from the beauty of the game. Perhaps Nintendo is relying on local play amongst friends to be the savior of the game because everything else falls short. This is one Link that I don’t mind missing. The game was provided by the publisher.